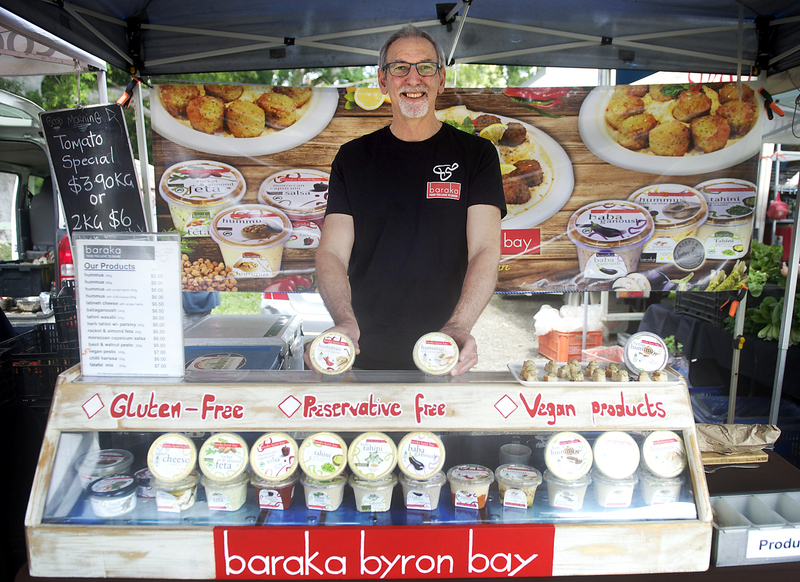 Alan Schwarz is the owner of the New Brighton Farmers Market Middle Eastern dip and gourmet food stall, Baraka. The business recently won two silver medals for its products at the Sydney Royal Fine Food Show. • Can you tell us a bit about the products you sell at the market? We pride ourselves on cooking Middle Eastern food and specialise in North African cuisine, including hummus, babaganoush, tahini and labneh cheese. Our products are made using traditional recipes passed down through the generations, with some modern adaptations. All of our products are gluten-free, GMO-free, preservative-free, and we use no artificial colours or flavours. Most of our products are vegan, and we have many products with no garlic. • How did it feel to win the Silver Medals at the Sydney Royal Fine Foods Show for your Hummus with Chilli Harissa and Hummus with Za’atar Herb? • You recently launched a hemp hummus, can you tell us a bit about that? • What question do your customers ask you most often? Many people ask whether our products contain garlic – and are delighted to find our hummus and other products that are garlic-free. They’re amazed our products have so much flavour without garlic. • What motivates you to get out of bed every day? My vision is to encourage healthy eating through quality food products, and put environmental best-practice into action. We support ethical, clean, green suppliers, compost all our plant waste, minimise packaging and recycle whatever we can. • Do you have a favourite product? All our products are amazing, but I am particularly keen on our Babaganoush and Hummus with Za’atar Herbs. These products are very traditional. Our new Hemp Hummus is my current favourite. • What’s the best thing about being part of the farmers market? The heart of Baraka is about people, and the farmers market is a great way to meet our people face-to-face, and hear their feedback about our products. I love seeing customers delight when they taste our products – we’ve been told many times we make the world’s best hummus! • Tell us something most people wouldn’t know about you? I have a background as a grape grower and winemaker and by choice moved to this region. My wife and I are currently raising our 7yo ADHD grandson, and this is highly motivating and very rewarding in our personal lives. • What would you be doing if you weren’t doing this? We are motivated to make a difference in people’s lives, so I would be volunteering or contributing locally or globally in some way.